ZipBooks is the leader in bookkeeping, reporting and review management for small businesses. Gather great customer reviews while viewing the health of your business. Send professional invoices in seconds, get paid seamlessly with Square, and simplify billing with set-and-forget recurring invoices and automated payment reminders. 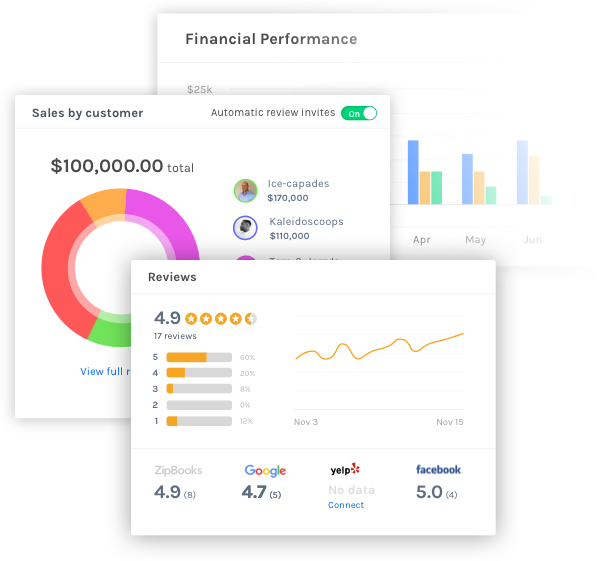 Bookkeeping and reporting are smarter in ZipBooks, with dead-simple reconciliation, sales and customer reporting with Square transactions, auto-categorization, and intuitive color-coding so it all just makes sense. ZipBooks can manage one or multiple business locations. We'll manage and update your business listings — making sure information is accurate and you're on local business listings and on every map.